If anyone rides along the north shore trail, can you report on what was done? I called 311 about the traffic light on the 31st Street Bridge because it would make me wait forever to cross River Ave. See Bike/Ped unfriendly intersections for details. That’s a very long light but a very complex intersection. Route 28 n and s, ritalo, 31st street bridge, and river Ave. I think they are doing the best they can with that intersection. @erok The gaps in the sidewalk/trail have been fixed. They put a layer of asphalt, so now you have a sweet little ramp. I ride the at section of north shore trail and never thought to say anything to 311. @jstalnaker2112 thanks for the update. that’s great news! 311ed an abandoned bike on the ramp that takes you from Hyde Park steak house to the north shore trail. It has been totally stripped. There’s also an abandoned bike, non stripped, in Millvale leaning against the picnic shelter. It has been there for weeks. I didn’t tell Millvale Bei give up with them. I’ve emailed, called, tweeted, and Facebooked messagedabout the glass in the river front park parking lot for weeks and they don’t respond. If anyone wants to try, go ahead. Also, I 311ed a broken grate on river Ave by the Heinz plant and I got a thanks for “drainspotting.”. Cute! That broken grate, wouldn’t happen to be an unbroken but deadly grate at the corner of River and Chesbro, would it? That’s been 311’d so many times it’s not funny. It’s lined up perfectly to nail cyclists making the transition from the trail to the 16th St Bridge. Watch out for the broken glass on the path between Arsonia Place and the South Bank T station. Swept away the months old broken glass in Millvale riverfront Park parking lot as my millions of emails and calls to the boro didn’t accomplish anything. A cop even drove by and didn’t stop. So I guess they don’t really care. Grate wasn’t that grate. It was further down river Ave.
311 a broken bollard base on 3 river heritage trail near island ave. I have stood the bollard up a few times, but any touch and it falls. I think that one was over in the bushes for a while? It did disappear for a day or two. I tend to zone out and kept forgetting to look on my rides home. By the time I remembered to stop someone else had placed it back on the bolts. Tis the season for the freeze-thaw to start hammering our streets with potholes. Don’t forget to put in tickets for potholes. I reported one on 44th today across from the children’s hospital ambulance entrance. This week, Pothole Blitz. Submit your Tickets. On 1/24 I reported to 311 “bad potholes on Bigelow in the Schenley Farms area, for several blocks” and today they replied “service request closed”, “Completed by 3rd Division”. I don’t get to Bigelow often, so I hope others check if the city did a decent job here. There is broken glass on the sidewalk leading from the 40th Street Bridge from Millvale. There is also mud on NST near Heinz Plant. Campers have been in the area all Spring and Winter so far. Those are the usual homeless people who live along the trail . I’ve been a bit obsessive while riding around recently. there’s some real craters out there. The 24th block of Smallman is no joke. the mayor seems to be playing defense on twitter right now on the pothole issue. explaining how they need dry weather to fill them, etc. my guess is there will be another pothole blitz, so save a cyclist and report your potholes! Always reporting… I don’t doubt they use these reports somewhat in choosing roads to pave next season. This reply was modified 1 year, 2 months ago by Benzo. It looks like another pothole blitz is coming. 311 those potholes! A sinkhole on Ellsworth between Neville and Devonshire. This is a real danger; be careful. westbound there is a very deep hole in the street. This is not a pothole! Radius is ~2 ft but you can see several feet down. Please mark asap, and fix. If you see it please send in your own report. With sinkholes in the past, I’ve had some success of calling the PGH20 emergency line, specifically for one that formed on S. Negley this summer. If you want to call them, the number is 412-255-2423. Well, I 311’d and I called PWSA. On the way home I passed the spot again. It now has a second, so far smaller, crater developing… On the whole I prefer geysers; at least you can tell there’s a problem up ahead. On Ellsworth, the City got there first and put up a DPW barrier (and “closed” my 311 item). The craters continue to develop nicely. The Pittsburgh Water and Sewer Authority is meeting with customers and residents to forge relationships and re-establish trust during this year of transition. 2018 is a year of transition for the Pittsburgh Water and Sewer Authority (PWSA). From transitioning to PUC oversight and beginning to address long-standing challenges, it’s the start of a new era for PWSA. One that puts customers, and our accountability to them, first. Several meetings with neighborhood community groups are scheduled through May. Later this year, PWSA will host its own community forums to have an open, engaging discussion about the future direction of the organization. All meetings are open to the public. Please use the link below for a complete list of meetings already scheduled. More information about this outreach initiative as well as the meeting schedule is available on our website at http://www.pgh2o.com/communitymeetings. Keep 311ng potholes. There was an item in the paper today that while the state and county seem to be exempt from damage from potholes the city isn’t if the pothole is reported and not fixed in a “reasonable” amount of time. I’m twitter-annoyed with the city over the railroad tracks on river ave, as some other bike-pgh members have been supporting me on twitter. The city seems to be playing dumb with the problems re: the railroad tracks. They are the worst shape i’ve ever seen, terribly unlevel, rocks all over the place. 311 requested “more information” because, obviously, my photo attached to the 311 request wasn’t good enough. They’re also trying to put some of the blame on conrail, since they maintain the tracks, even though they are orphaned tracks. So, can I get some help with 311 requests for this? Your photos attached to 311 requests will hopefully bump up the priority of this dangerous crossing. I think 311 has learned to tune me out since I 311 a lot. More voices would be helpful. Also, I contacted penndot because some helpful penndot employee left a orange detour sign on its side on the highland park bridge sidewalk, blocking the sidewalk for wheelchairs and bikes. Luckily penndot seems to be very responsive to ADA violations and will probably remove this today. Watch out re river Ave triangle tracks. Today I checked on them after getting cranky with pgh311 on chitter (thanks to benzo and buffalo for backup) and there is a huge hole from where a buffer once was. Someone’s tire is going to get eaten up and the same someone’s head is gonna get mushed on the pavement. I also 311ed Homewood Ave between frick park and Penn Ave. The entire street is potholes. I think there are more potholes than actual functional road. Yes, we will consider this request in our efforts to make safer biking conditions. This reply was modified 1 year, 1 month ago by RustyRed. Are the signs posted in both directions, and do they work? Would installing BMUFL signs here help by any chance? Allegheny River Blvd. past Washington Blvd. 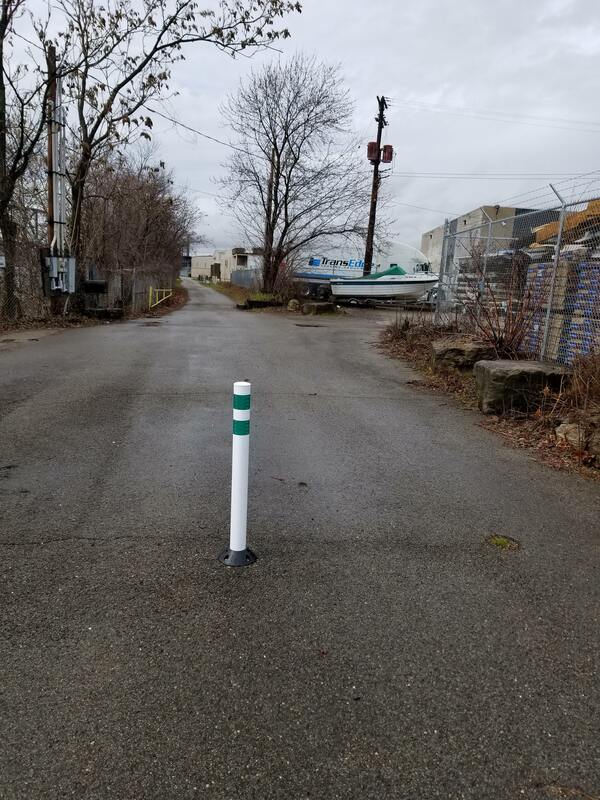 Bollard finally replaced on North Shore Trail and Island Ave. Looks like 311 also took the neighbors giant orange cone that was used to cover the bolts for the last few months. They’re also trying to put some of the blame on conrail, since they maintain the tracks, even though they are orphaned tracks. This reply was modified 1 year ago by Mikhail. Wish that the city would compel the RR to make them non dangerous. They are awful right now. City was working on them last summer. Guess they didn’t know it was the RR responsibility at the time. After five years of 311ing the wheel eating drain grate at River and Chesbro, it finally got replaced. Tree down, Junction Hollow Trail. A few weeks ago I noticed a no trespassing sign on the North Shore Trail right where River Avenue climbs to meet the 31st Street Bridge. It was in the grass median between the trail and River Avenue. The sign was terribly rusted in was probably there for 20 or 30 years. I 311. And I noticed today it was gone. A small victory. I’m amazed that I never noticed that sign before giving that I use the trail several times a week and I have for the last several years. I think we all suffer from sign fatigue. I’m sure there’s a history of why that sign was put there in the first place, and why it stayed up for so long. Related: Have they *yet* removed the “Sidewalk Closed” signs at the PA65 end of the McKees Rocks Bridge sidewalks? The bridge work wrapped up in 2009.